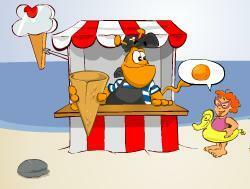 The Ice Cream Stand is an great little game for improving concentration and brain power. To begin, click the Small, Medium, or Large link or Very Large button under the picture of the game at left. This opens the game in a pop-up window. Plus, if you play this game enough you'll be ready for that career in the fast food industy! Click the "Start" button on the game to begin. The onscreen instructions are written in German. Doesn't matter, though, because the game is easy to play. If you like this game, you might enjoy the other free memory games on this site, such as Lightning Librarian, Trolley Dash, and Brain Safari. HOW TO PLAY. You are the ice cream server at a beach-side ice cream stand. As each kid places their order for an ice cream cone, you need to remember which flavors they ask for. As the kid asks for a flavor, a picture of the flavor appears over his or her head. Then, all the possible flavors appear at the bottom of the screen. You need to click on the flavors that the child asked for, in order. As you select flavors, the scoop you clicked appears in the cone you are holding. After selecting the flavors, click on the child who ordered the cone. If you get the order right, the child is happy and moves on down the beach. If you get it wrong, the kid gets upset and that's one strike against you. Get four orders wrong and you lose! During the first round, each child only asks for 3 flavors. But as you complete each round, the game gets more difficult, with the kids asking for four, five, or more scoops on their cone. This game is great for short-term memory, because you are required to remember the different flavors (and the sequence) as kids place their orders. One of my favorite parts of the game is the beach-side ambience. The sound of the waves in the background is just great. Have fun! Game distributed by Games68.com. Used with Permission.